You must feel confused why you can't transfer MP4 to iPhone and why iPhone won't play MP4 files (EXM). If you can't figure out the reasons on your own feet, please spend 1 min here to read on the reasons listed below. Reason 1: iPhone accepts video files with .mp4 file extension. But iDevice doesn't support all the varieties of .mp4. Only the .mp4 file encoded by H264/HEVC/MPEG-4/Motion JPEG video and AAC audio codecs can be successfully transferred to iPhone with no problem. Reason 2: why iTunes can play local MP4 files while iPhone can't? Your MP4 file parameter settings should take responsibility, incl. resolution, frame rate, etc. Reason 3: this is to explain why online MP4 video isn't playing in Safari on iPhone. Because HTML5 player delivers an in-and-out showing on iPhone. In short, iPhone MP4 problems are mainly caused by MP4 codecs, MP4 parameter settings and HTML5 player. Hence, our workarounds are converting MP4 codecs, adjust MP4 parameters and download MP4 video to iPhone without using HTML5 player any more. Now let's suit the remedy to the case one by one. - To download online MP4 video for offline playback no HTML5 player issues. No.1 fast speed to convert MP4 video to iPhone XS/XR/X/8/Plus/7/6s/6/SE/5s supported H264/H265/MPEG-4 and AAC codecs, as well as convert MP4 to iMovie, iTunes, iPad, Galaxy Note 8/S8, Huawei, Xiaomi, Nokia, Blackberry, Microsoft, game consoles, etc. at 250FPS - 320FPS (Intel Quick Sync Video supported). Convert MP4 to iPhone with best parameter settings: H.264 codec up to 2160p, 30fps, audio bit rate up to 160 Kbps, 48kHz and MPEG-4 codec, up to 640X480 pixels, 30 fps, AAC-LC audio up to 160 Kbps, 48kHz. Of course, you can free adjust MP4 parameters incl. resolution, frame rate, etc. Free download online MP4 video as well as MKV, AVI, FLV, HEVC, etc. from YouTube, Facebook, Dailymotion, Vevo, Myspace, etc. 300+ sites to iPhone X/iPhone 8 Plus for offline watching without HTML5 player. Thus, the MP4 not playing in Safari on iPhone problem is easily fixed. 1. Can't Transfer MP4 Vidoes to iPhone? 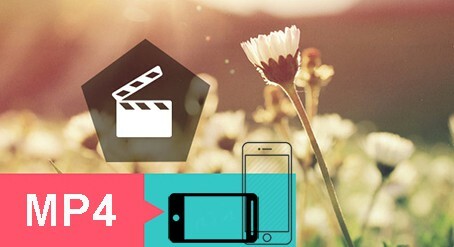 - Convert MP4 to iPhone Supported Codec First! Here you can start with the detailed guide on how to fix unable to transfer MP4 to iPhone problem. If you don't have such trouble, you can just skip this part and go straight to the next part you need. Drag-and-drop MP4 video file or click "Add Video" button to import MP4 files after you Free download MacX Video Converter Pro on macOS (or Windows version) and fire it up on your computer. Click "to iPhone" under "Apple Device" profile and select "iPhone X (H264)" or "iPhone X (MEPG-4)" as output video format. Click "Browse" button to choose the location where you save converted iPhone MP4 file on your MacBook, iMac, Mac Mini, Mac Pro or Windows. Note: to speed up MP4 to iTunes converting speed, you're strongly suggested to check the box of hardware encoder on the bottom right corner of the interface. Tap "RUN" button to activate this top MP4 converter for Mac. And it will begin to convert MP4 files to iPhone X (H264/MPEG-4) on macOS/Windows. After it's over, use iTunes or iTunes alternative MacX MediaTrans to transfer MP4 to iPhone X/8 Plus/8/7/6s/6 if you think iTunes is too troublesome to use. If your iTunes can successfully play MP4 files on macOS, but your iPhone can't play MP4 (H264 or MPEG-4) well, you need to check if your MP4 video parameters are suitable for your iPhone model. If not, import MP4 to this top video converter to adjust MP4 parameters like resolution, frame rate, audio bit rate, etc. Prior to adjusting MP4 parameters, you need to know the parameter setting range iPhone supports. Here we round them up in the below table. Step 1: Load MP4 File. Follow above Step 1 to add MP4 video file into this MP4 video converter. Step 2: Click Settings Button. If your original MP4 is encoded by H264 or MPEG-4, then you just select the original MP4 codec. Then click the "Settings" icon next to the output MP4 image icon on the main interface to enter the MP4 video parameter settings zone. Select the frame rate you want among 23.97fps, 25fps, 29.97fps and 30fps. Choose the resolution based on your MP4 codec, 640x480, 960x640, 1280x720 or 1920x1080 for MP4 H264; 640x480 or lower resolution for MP4 MPEG-4. Shift your attention to Audio Options to freely adjust audio bit rate from 32kbps to 160kbps and sample rate from 16000 to 48000. Step 3: Save Parameter Settings to MP4. Click "OK" and hit the "RUN" button to save the changed parameter settings to MP4 video file. This process is very fast without the process of codec conversion. After the procedure is finished, transfer MP4 videos and play it on iPhone to see its playback effect. The reason why iPhone Safari web browser can only play some MP4 videos (not all MP4 files) is that the HTML5 player doesn't work stably in Safari. To radically solve this iPhone MP4 problem, the best solution is to free download MP4 video to iPhone for offline watching on iPhone X/iPhone 8 Plus and more without the weak HTML5 player. How to download MP4 videos to iPhone? 3 steps! Step 1: Free download MacX Video Converter Pro on macOS and run it, copy the URL of the MP4 video page and then paste the URL to the analysis bar. Followed by a click to "analyze" to load the MP4 YouTube video details. Step 2: Choose video format, resolution, codec and file size according to your iPhone model (4.7-inch or 5.5-inch, 16/32/64 or 256GB model). Optional: Click "Browse" button to specify an output folder on your Mac to save the output MP4 files. Step 3: Tap "Download Now" button and it starts to download videos from YouTube free on MacBook, iMac, Mac Mini, Mac Pro and more. Different countries and regions have different laws and regulations about when it's legal to free download video or music without the copyright owner's permission. Thus, you need to abide by your local copyright protection act and download video files under fair use. 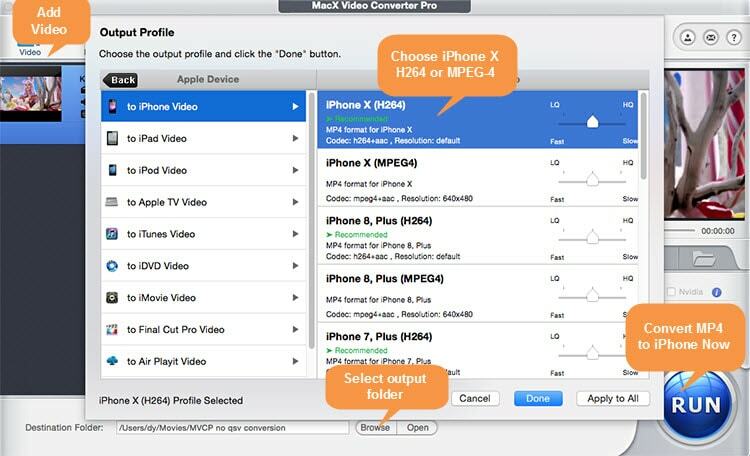 MacX Video Converter Pro, whose powerful ability enables you to convert MP4 to iPhone MP4, MOV formats with H264/MPEG-4, AAC codecs, adjust MP4 parameter settings (resolution, frame rate, bit rate, etc.) and download online MP4 video movie for watching without HTML5 player.